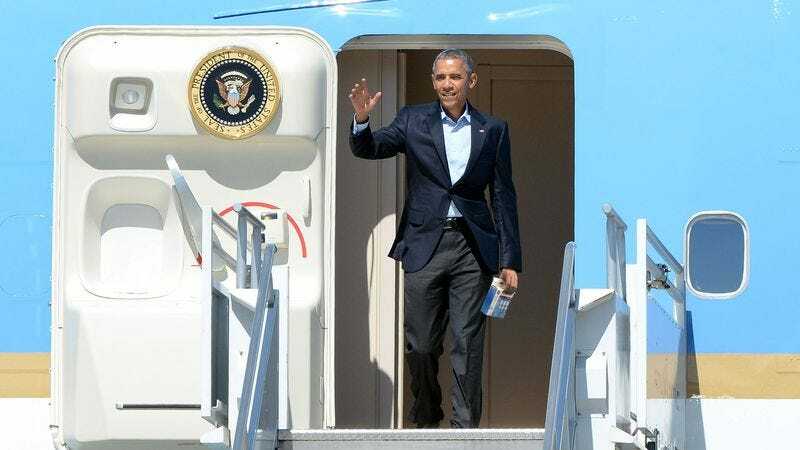 WASHINGTON—Triumphantly displaying the fruits of his diplomatic talks with 150 fellow world leaders at the COP21 climate change summit in Paris, President Obama returned to the U.S. this week with a couple energy-efficient light bulbs. “The international community came together with a common agenda to limit the devastating effects of global warming, and after much negotiation, we were able to secure several energy-saving light bulbs for every nation in attendance, which will ensure a more sustainable future for our children and grandchildren,” said Obama, holding up the two-pack of 60-watt equivalent bulbs and adding that, while they were initially more expensive than traditional incandescent bulbs, the cost would be recouped over time, as LED bulbs last 40 to 50 times longer. “These bulbs use 75 percent less energy than typical lighting and are Energy Star certified, and that will make a significant impact toward limiting the damaging effects of climate change. And not only will these LED lights reduce the nation’s carbon footprint, but they will also save a considerable amount on monthly electricity bills. That’s good news for the planet and our wallets.” Obama conceded, however, that the agreement fell short of his initial hopes that every country would walk away from the summit with five energy-efficient light bulbs apiece and a low-flow toilet.